Hritik is doing, SRK is doing, so Chetan Bhagat and Shashi Tharoor, what’s that? Yep! 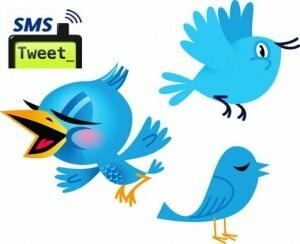 that’s Twitter – is a free social networking and microblogging service that enables its users to send and read messages known as tweets, text-based posts of up to 140 characters. Twitter is targeted as SMS based realtime social networking. With growing number of celebrities & business houses joining the Twitterverse, India’s ‘cattle class’ is also following the trend. Recently Twitter passes 10billionth tweet. Twitter can be accessed over internet, via some apps and of course by sms. Internet and using application (twitter client) means you need a computer with internet connection, so depends on a web browser or install a twitter client or GPRS-enabled handset. Twitter has no sms short code in India, only Airtel customers can use Twitter via sms to 53000, which costs Re1 per sms. And this is only for Airtel customers. SMSTweet.in comes to fill this gap, it is in service before Airtel came. SMSTweet is a brainchild of Mayank. This application uses SMSGupShup’s platform (Appshup) to receive and respond to user generated SMS and Google App-Engine as the server to run. SMSTweet.in is designed by Rohit and logo was made by Harshad. SMSTweet is applicable to all operators – whether it is CDMA or GSM. And there is no premium charge like sms to 5XYXY costs Rs3 for most operators. At present they have two short codes: 09220092200 (Mumbai) & 09243000111 (Bangalore). So people from Maharastra & Mumbai and Karnataka can use SMSTweet at just local sms rate, while people from other states are to be charged at STD rates. SMSTweet says: ‘In due time we may have a local number for every city.’ If your operator offers national sms free with their sms pack, you can opt it and enjoy SMSTweet free, for eg Reliance offers local and national sms at just 1paisa! Tweeting ‘TWT <your message>’ to 09220092200(Mumbai) or 09243000111(Bangalore). If everything went well then you will recieve the latest mention of yours. Reading Updates Sms “TWUP” to 9243000111 to get latest tweet from those you are following. SMS ‘TWUP <n>’ get n’th tweet from your timeline. eg. SMS “TWUP 23” will return 23’rd tweet from your timeline. Note that 23’rd tweet is relative to time you sent the message. If an hour later you receive some more tweets, your 23’rd tweet will be different. SMS ‘TWUP <user_name>’ get the latest tweet in your timeline from user_name. user_name can either be a full twitter handle of the friend whose tweet you want or a part of it. For eg: SMS “TWUP smstweetin” to get latest tweet from smstweet. You can save on typing the entire name by typing just a part of the name. For example SMS “TWUP sms” will fetch first tweet from your timeline whose twitter handle matches “sms”. Latest mention Sms ‘TWME’ to 09220092200 (Mumbai) or 09243000111 (Bangalore). Direct Message Sms ‘TWDM’ to 09220092200 (Mumbai) or 09243000111 (Bangalore). ** with both ‘TWDM’ and ‘TWME’ you can add a number, and it will send you that message in your mention/direct message list. Note it works only till 100. Has this service been discontinued? Any other alternatives except from the default twitter number, 53000 ?